Joan D. Brumback, (nee Shuster), age 92, of Lorain, passed away on the evening of Thursday February 7, 2019 while a patient at the Del Ray Medical Center in Del Ray Beach, Florida. 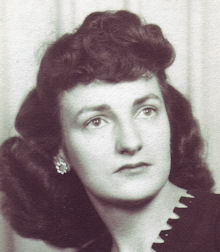 She was born in Lorain on November 10, 1926 and had been a resident of Lorain for the majority of her life. A graduate of Lorain High School, Joan began her working career at Northrop Aviation as part of the production team that built the P-6 Black Widow fighter plane at the company’s facility in Hawthorne, California during World War II. She returned to Lorain in 1945, and worked as an administrative assistant at the National Tube Company in Lorain. In 1949 she entered the United States Army and fulfilled duty assignments as a Private First Class. Joan was an advocate of higher education and was successfully able to balance her career along with her responsibilities as a wife and mother, while simultaneously attending evening classes which ultimately led to her earning three degrees; they included an Associates of Business Administration from Lorain County Community College in 1979, a Bachelors of Science Degree in Business Administration from Cleveland State University in 1983, and an M.B.A. also from Cleveland State in 1985. Joan continued to instill the importance of education in her children and grandchildren by taking them on frequent visits to the Lorain Public Library. Her support and guidance led her children to earn a total of eleven college degrees. In 1969 she joined the Lorain Public School System in an administrative role and worked her way to appointment as Treasurer for the school system in 1975. She retired from the district in 1992 following a career that spanned more than two decades with the district. Joan was a parishioner of St. Vincent de Paul Catholic Church in Elyria Township and was also a member of its Altar & Rosary Society and a volunteer with the bingo program. In her free time she enjoyed league bowling; at the age of ninety she was still a familiar face at the bowling alley and recognized as the oldest member of the league. She is survived by sons Daniel Brumback (Elizabeth) of Boca Raton, Florida and Neil Brumback of Lorain, along with daughters Sandra L. Furterer, PhD ( Daniel) and Kathy Bauman (Mike) both residing in Dayton. She also leaves eight grandchildren, two great grandchildren, and sister Rita Bennett of Lorain. Joan was preceded in death by her husband Melvin in 2005, sons Terrance in 1953, and Timothy in 2014, parents Charles and Margaret (nee Kuszkewicz) Shuster, brothers Walter and Raymond Shuster, and sisters Veronica Kapron and Mary Smith.